Costa Rica is a small country with rich wildlife due to its number of ecosystems and not to be left behind, we have one of the most diverse and marvelous marine worlds. Discovering the undersea ecosystem of Costa Rica by scuba diving or snorkeling is a magical experience. The rich-nutrient waters have the perfect conditions for the marine world to coexist. Most tour offices you can rent the necessary equipment since there are snorkeling and diving spots all over both coasts. Let’s explore some diving/snorkeling places that you must visit along the Pacific Coast! In the North Pacific coast, you will find plenty of diving and snorkeling spots full of marine life. The best time to immerse into the submarine world is during the months of May to December, nevertheless, each spot has its time-frame due to the winds that affect the visibility. We recommend you calling the tour’s office to check on the visibility previously. Two remarkable spots that you MUST visit in the North Pacific are Isla Murcielago (Bat Island) and Catalina’s Islands. Located on the tip of Santa Rosa National Park, Isla Murcielago is one of the renown places worldwide for expert divers. Here, you will be able to swim within giant bull sharks, manta rays, turtles and tropical fish. In the other hand, Catalinas Islands which are a group of 20 small islands for all levels of divers and snorkelers. The islands are known for a large population of all types of manta rays like and during winter, you will most certainly see the Giant Manta Ray of the Pacific. There is also a large population of white tip sharks that live in the rocky caves of these islands. Humpback whales, pilot whales, whale sharks, and dolphins have also been spotted in both areas. Although the interaction with whales and dolphins has been banned to protect them and not interrupt their natural course, if come across one be grateful to admire their beauty and feel privileged to watch them freely, in their natural habitat. 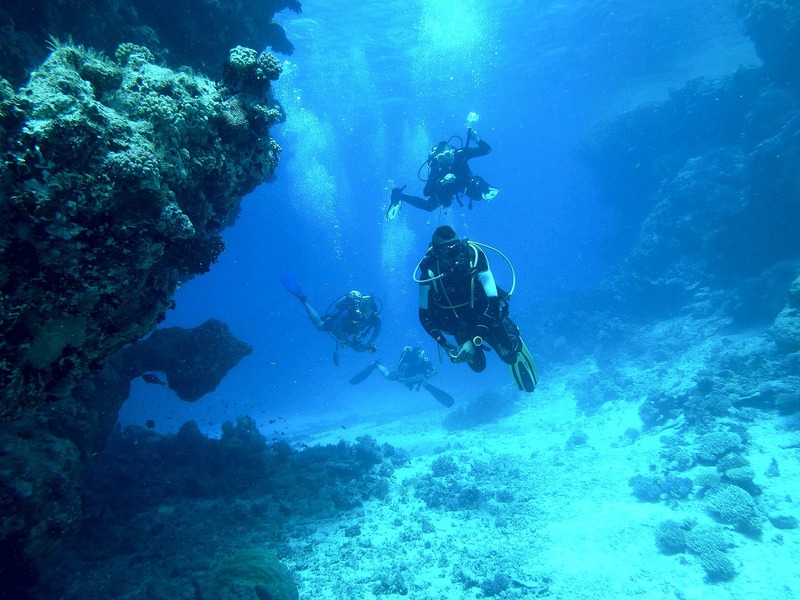 Also, If diving is not your thing, there are reefs and rock formations at a higher level for you to admire the marine life from the surface with your snorkel equipment. In the Southern Pacific Coast, you will find some of the best diving and snorkeling spots with good visibility all year round. The famous Biological Reserve of Isla del Caño off the coast of Drake Bay in the Osa Peninsula is rated as one of the prime diving places due to its abundant marine life. The Biological Reserve offers beautiful and accessible places for snorkeling as well, where you will be able to swim between corals, turtles, sea rays and colorful fishes. Nevertheless, El Bajo del Diablo, Paraiso and Cueva del Tiburón are deeper spots for scuba divers where they will be able to see white tip sharks and bull sharks on almost every dive. There are more fish than any diver can handle, you will swim within thousands of schools of colorful fishes of different sizes. The coral gardens found in Isla del Caño create a perfect undersea scenery worth of discovering. There are also daily tours for all levels of divers and snorkelers launching from Uvita beach and Dominical, two well-known beach towns for surfers in the southern zone as well. 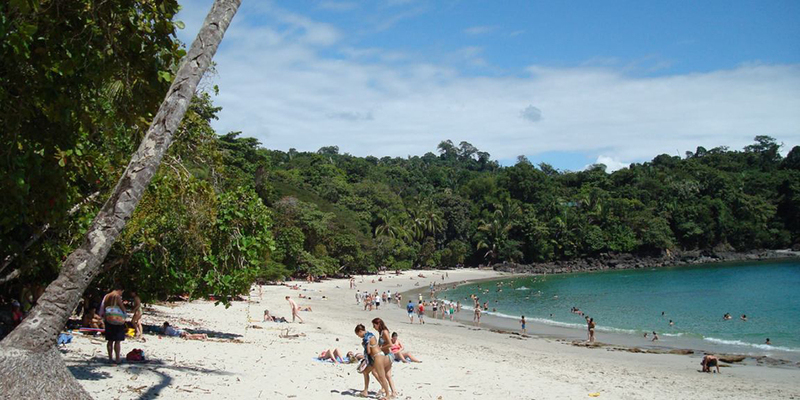 In the Central Pacific, you will find one of the most famous national parks, Manuel Antonio. Here you will find beautiful beaches with crystalline waters and perfect conditions for snorkeling. Marine life includes rays, colorful fishes, bright corals and sometimes you will be able to interact with sea turtles. The best time for snorkeling or diving in nearby rock formations is from November to April. Protected areas along the coast help to preserve marine life and this is why animals live freely in a natural habitat. During the expedition, you will find coral reefs, atolls, volcanic rock formations, shark caves, shipwrecks, and some of the most beautiful animals. Costa Rica’s has the perfect combination of temperature, clearness, rich-nutrient water, and abundance of wildlife for everyone to explore either snorkeling or diving. The undersea life in our country will surprise you! Most of Costa Rica’s population is Catholic, so when it comes to easter we are talking about one of the most important holidays of the year. This year 2019, the holy week starts from April 15th to April 21st, being Thursday and Friday the only holidays by law for the private and public sectors. Nevertheless, the celebration begins earlier since most of the people and institutions take the entire week off. According to a study by UNIMER Central America, 9 out of 10 “Ticos” prefer to travel and discover Costa Rica rather than flying away during the holidays since they choose to visit beaches or other touristic areas. Especially during holy week, the dry season is coming to an end and the climate is perfect to migrate to the Pacific Beach. Tamarindo, Langosta, Uvita, and Jaco are some popular spots. You will find several activities during the week such as live music, dancing places, shows during the sunset, and lots of friendly people enjoying a quick vacation. It won’t matter if you are in the mountain, central valley or at the beach, the festive feeling will fill the streets. People gather outside and enjoy their off-work time and different traditions with typical food, dancing, masquerades, family and friends. During these days you will also be able to appreciate Catholic demonstrations with parades. You’ll be surprised to see locals of all ages walking down the streets, dressed up with tunics, carrying a cross and singing church songs, even at the beach with the extremely warm temperatures. On Sunday churches are full. Then, they head to their homes to celebrate Easter with family or close friends. Now, let’s talk about some considerations for this holiday. First, most businesses might have shortened hours or be totally closed from Thursday to Sunday, especially banks. Government institutions and businesses will mostly be closed for the entire week. Plan ahead! This is the peak season and most lodging options and car rentals can be fully booked several weeks before. Also, consider that prices tend to rise during the high season. If you enjoy alcoholic beverages keep in mind liquor can not be sold legally on Thursday and Friday in certain municipalities. If you want to have a cold beer at the beach or sunbathe while sipping from your favorite cocktail you might have to buy the alcohol in advance. Traffic jams can be a serious problem if you are not used to driving for several hours. Many of these delays can be caused by religious processions while others are due to the amount of locals heading to the beach. Try downloading Waze if you dont have it to possibly find a route around Jesus. Also, local flights can have higher prices during this week so you might want to consider driving a good alternative. Take it easy, the wait is worth it! Soon you will be enjoying crystal clear waters with the perfect temperature under the sun. Costa Rica, during April, has a beautiful climate ready to enjoy the beach and the mountain. It is a time to relax, be grateful and most importantly share with family and friends. Costa Rican volcanoes are one of the main touristic and scientific attractions. The country belongs to a part of the Pacific Ring of Fire, where most volcanoes and earthquakes are formed. There are more than 200 known volcanic formations, most of them are located in the northern part of the country, and 5 of them are currently active. Probably the most famous volcano due to its constant activity and touristic area. La Fortuna de San Carlos is a populated town right at the base of the volcano with amenities like 5-star resorts, villas and lodges, tour offices and typical food restaurants. At nights, if you have a clear view of the peak you will see smoke coming out of it or even some small orange splashes of lava. During daylight, you will also be able to admire the smoke and the grey tip of the mountain with less vegetation than the rest of it. You will find all kinds of outdoor activities while enjoying the astonishing views of the volcano. Thermal waters are a must! These waters heated by the veins of the volcano are known to be a natural treatment with tons of minerals and multiple benefits like cleaning your blood through sweat, reactivating metabolisms, relaxing and rejuvenating the skin between others. You will also find the Tabacon River and Lake Arenal allowing you to enjoy water sports like kayaking and wake-boarding. There are also activities like horseback riding to through the volcano, zip-lining through the rain forest, hiking to cascades and many more. Come and discover this famous town of La Fortuna and enjoy the amazing views of the Arenal volcano! Located in Alajuela, this volcano is only an hour and a half away from the center of San Jose, the capital city of Costa Rica. It is an active volcano with 8,900 m high and 2 craters, the biggest one measuring 1.5 km with a large green lagoon constantly expelling gases. The national park where it is found reopened in 2018 after the last explosion which led to modifying the park’s hours from 7 am to 1 pm and a maximum of 1000 visitors per day. The ideal time to visit the craters is during the morning since you’ll have more probability of a clear view. In adjacent towns, you will find restaurants with some of the best typical food and street sales with fresh fruits, especially some juicy strawberries! Close to the park, you will also find La Paz Waterfalls, a privately owned ecological park with a chain of waterfalls and an animal sanctuary with more than 100 species. This is a great hiking experience where you will learn both from the volcano and the animals that inhabit the area. 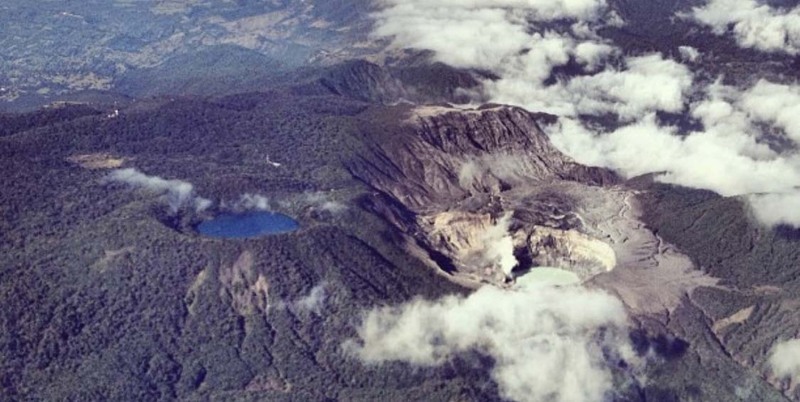 Irazu is the highest existing active volcano in Costa Rica measuring 11,260 feet tall with a 500 km2 base. It has the main crater which measures 300 meters long called Diego de la Haya. It contains green waters and fumaroles constantly releasing toxic steam. The name Irazu is an indigenous word which means “thunder and earthquake mountain”. Located in Cartago, you will find the Volcan Irazu National Park open to the public but closing at 3:30 pm. The best time to visit is in the early morning during the months from December to April, the dry season. There is an abundance of vegetation due to the fertile soils that has been nourishing naturally after the last eruption. You will find a chilly climate with a breeze and some rainfall. If you are visiting this volcano be sure to make a pitstop in the gardens of Prusia for a picnic. This is the most active volcano in the country and the second largest one! It is located in Cartago but not the most popular volcano to visit since there’s not much development nearby. You will find some small hotels and rental villas in the base of the volcano as well as tour offices to visit the national park although they are constantly regulating the entrance since it’s still very active. You will be amused by the abundance of flora and fauna in the area. Animals like giant toads, toucans, howling monkeys can be found in the park as well as green lush valleys with milk farms where they produce the famous Turrialba cheese. Located in Guanacaste this volcano is located in a 34,000 acres national park which includes two volcanos and a variety of flora and fauna. There are more than 32 rivers and streams and thus a numerous amount of activities to enjoy the views of the volcano. There are thermal waters, fresh lagoons, zip lines and horseback riding tours through the park. The abundance of animals here is impressive! You’ll some of the biggest felines like pumas and jaguars that inhabit the area. There is a 6-mile excursion to the peak of the volcano where you will find the Von Seebach crater constantly releasing vapor. During the trench to the tip, you will encounter several ecosystems. From the highest point, you are able to admire astonishing views of the Nicoya Peninsula and the Nicaragua Lake, if you are lucky and you get a clear view you can almost admire most of Costa Rica. Much of Costa Rica’s economy rely on volcanoes which have contributed with the formation of soils rich in minerals. In Irazú and Turrialba you will find fresh vegetables with a big amount of minerals, in Poas volcano you have the juiciest and most delicious strawberries. Volcanoes also help by producing geothermal energy and provide construction materials for our roads and homes with the rocks expelled from the explosions. One final key detail to remember is that, as a byproduct of these touristic sectors generated around volcanoes, local producers get to grow and expand their businesses. 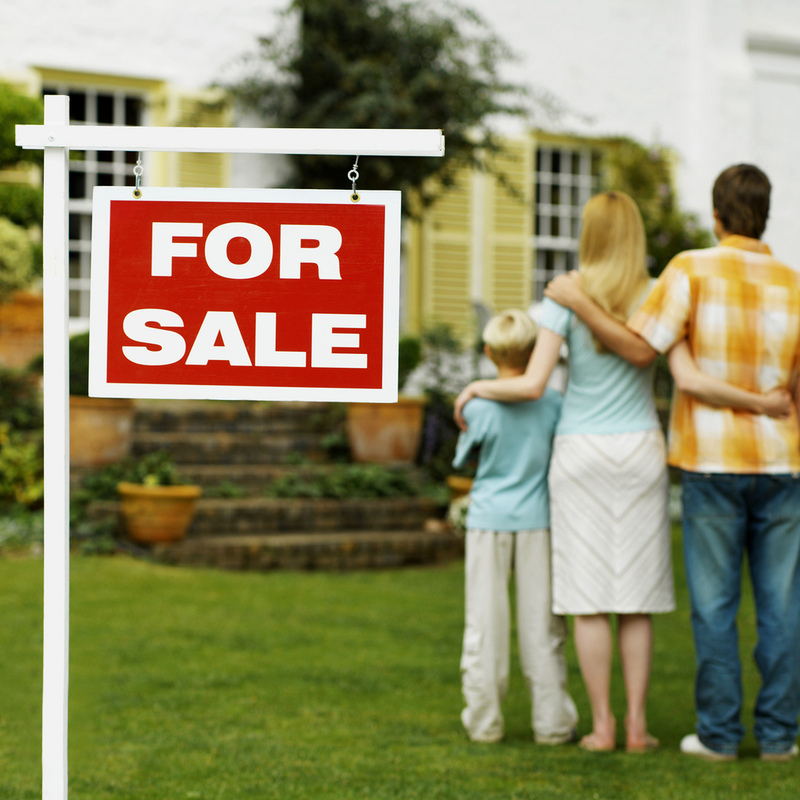 Choosing a realtor or a real estate agency to sell or buy properties is difficult anywhere. Here’s a guide with some tips on how to choose your real estate agency in Costa Rica. Practice makes perfect. An experienced realtor will always be able to answer your questions and guide you in the right direction regarding location, budget, type of property, and more. Knowledge of the Area. If you are looking to relocate, but still don’t know in which area, the agent will give you concise information about different locations that match your needs. Lifestyle and Recommendations. A local real estate agent will be familiar with the lifestyle of its specific location, therefore being able to recommend and pinpoint the best places for you. Realtors will have the best knowledge of schools, transportation, locations and more. Explain in details what you are looking for and the lifestyle you want to accomplish. Realtors will be pleased to find the best option when they have enough details to match it with the property. Make a budget from the beginning. Tell the agent how open you are about your financial status, and whether or not you need financing, i.e. if you would like to use an escrow or if you are flexible with your budget. Select your area according to recommendations. Prioritize your needs and preferences. Find someone with professionalism and commitment, giving you constant feedback on your property and the efforts done to market it. Ask for their experience in the market. How many houses have they sold? What types of properties do they specialize in? Talk about different locations, experiences, and situations that they’ve had when selling houses. Get to know how they work and the effort they put to each of their listings. Engage with an agency/realtor that has an effective working platform with enough exposure to reach the international market. Deal with an experienced realtor who has good communication skills, contacts, and connections with other agencies. Additionally, brokers tend to work alongside lawyers, so if you have any legal questions, they can clear it out. Financing is another area where realtors must have knowledge of, so ask all the questions you need. Videos – the modern way to market properties! Several webpages to share your property and tailor a larger market. Although these tips might be helpful, above all, home buyers rely on Internet searches as their primary Real Estate Tool, thus Online Reputation, Ranking, content is a must when looking for a Company to sell your property. If you have ever been to Costa Rica the first thing you notice yourself doing is asking yourself if you could live here? As time moves on you find yourself feeling more and more comfortable with the questions and before you know it you have your Real Estate goggles on and everything seems like the perfect match for you and your next investment. As you put the breaks on take it from someone that has been looking at land for 20 years in Costa Rica and has a few things that need to be taken into consideration. The first is everyone wants raw land. My first look with a real estate eye in Costa Rica is to not take a turn-key deal for granted. There is a lot to look at and although starting from scratch sounds fun in many cases someone has already done it for you and maybe even better. A second piece of advise is to look everywhere. 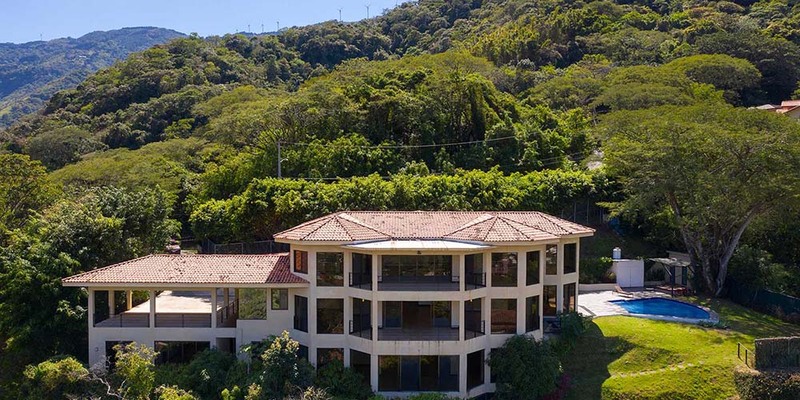 You will quickly notice that most of Costa Rica has pretty cool places and owning real estate in probably 70% of Costa Rica would be a desire by most. Take a good look at everything because you never know where your new adventure might take you. Finally, when entering the real estate market in Costa Rica take it slow. You are already 20 years late on the discovery of this place so there really is no rush. Let the initial excitement of owning in a foreign country take its toll then make a proper decision based on numbers and if you think your investment can generate 5%-10% a year after upkeep. Good luck. I have no regrets of buying in Costa Rica, although I wish I knew what I did now when I first started. Stanford University has plenty of impact and influence in the way our country constantly works to preserve the ecosystem. President Alvarado chose to present to their community the new decarbonization plan. The goal is to become a green economy with the promotion of clean energies to combat climate change. Known as one of the most prestigious colleges in the USA there are two main investigations being held in this college, Stanford Natural Capital Project and Stanford Woods Institute for the Environment were they choose Costa Rica as their study field due to the abundant natural resources and number of diverse ecosystems. The Natural Capital Project works on researching links between biodiversity and earth observations with health and well-being. The Woods Institute works directly with banks and financial systems to optimize resources intended for the protection of the ecosystem. Their reaction towards the plan has been very positive technical as well as inspiring. There are certainly several major changes to implement in the governments’ structure and management. Reforms include public and private means of transport, forms of energy, construction, industry and waste management. President Alvarado also states that it’s our responsibility to start working on the planet, the damage is evident and we have had extreme climate changes and natural disasters that need our attention. Alvarado was eager to present the new plan to the students who are constantly investigating and helping improve the country. His main statement during the conference was to spread de word about this plan, we must be an example for others to follow and start implementing major changes hoping to reduce deforestation worldwide. President Carlos Alvarado looks forward to other countries joining him in this new journey and this presentation is one big step. The goal is set for 2050, 31 years from now and they tend to work with 8 strategies to achieve this inclusive economic growth and sustainable development. As for now, this initiative counts with support from the Inter-American Development Bank (BID), Al Gore, former vice president of the United States and Michelle Bachelet former president of Chile. Costa Rica is known to be a country that carries 4% of the world’s biodiversity, this is for the sustained conservation practices through the years and hope that more countries follow the same path. We are still missing research in Costa Rica on some but real important facts like the social, economic, health and environmental impact of livestock as an integrated way to accomplish solutions to reduce the effects of this industry in our lives and others. We need to keep seeking and aiming for a better world and set an example for more countries to follow the same path. Each of us has an impact on the environment and the world so not only what we do, what our government does but what we eat will have a footprint and we need to seek better outcomes and best practices in order to contribute to next generations. Jaco Beach is located for its famous for its nightlife, party atmosphere and the beautiful beaches with some great surfing spots. 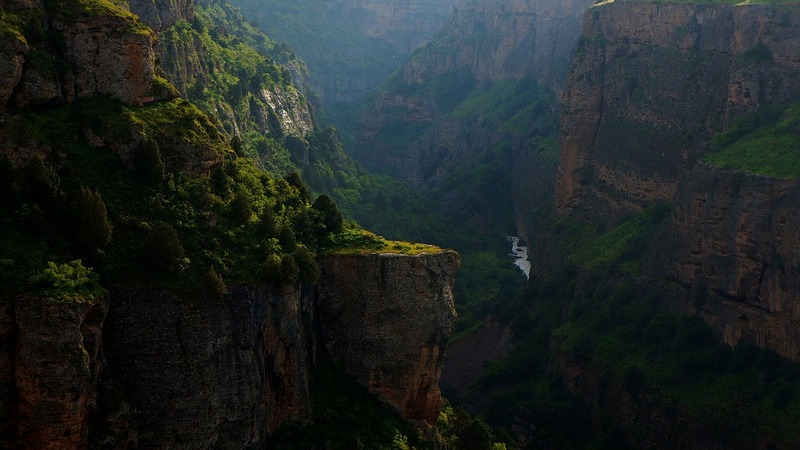 Just one and a half hours away from San Jose, you will find this energetic city. Located in the county of Garabito in the Puntarenas province, the city has a population of approximately 10,000 residents. 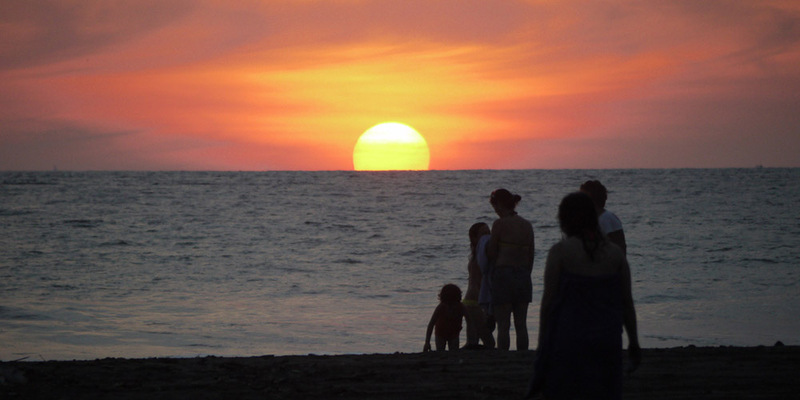 Jaco beach is 2.5 miles (4 km) long and offers some of the best surfing in Costa Rica. Jaco is a beach recognized for beginners surfers, the waves are strong and consistent enough for intermediate surfers as well, but not so powerful for those who are just starting out. On the main road, you will find Jaco Walk, a brand new shopping center with different gastronomic options such as sushi, burgers, Argentine barbecue or gelato that will make you feel like in downtown Miami. The main strip presents tons of souvenir shops and grocery stores. You will also find locals selling their handmade clothes on the beach and streets with beautiful typical designs inspired in nature. 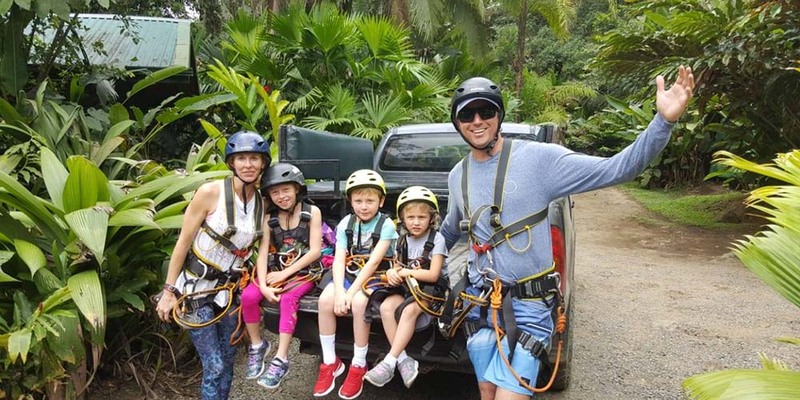 If you prefer outdoor activities, there are several companies that will help you, balancing on a rope in the best Tarzan style in a zip-line through the forest, bungee jumping, paragliding on the shore, or renting an ATV to drive through rivers and trails full of mud are several of the options offered. Looking for a peaceful activity? Rent a boat a kayak or catamaran and navigate to nearby beaches. You will hopefully see some whales and dolphins! Jaco Beach real estate is one of the most active real estate and rental markets in the country right now. Ever since highway 27 was completed in 2010, with increased accessibility to both San Jose and the International Airport, Jaco has received an influx of both local and international tourists and retirees. 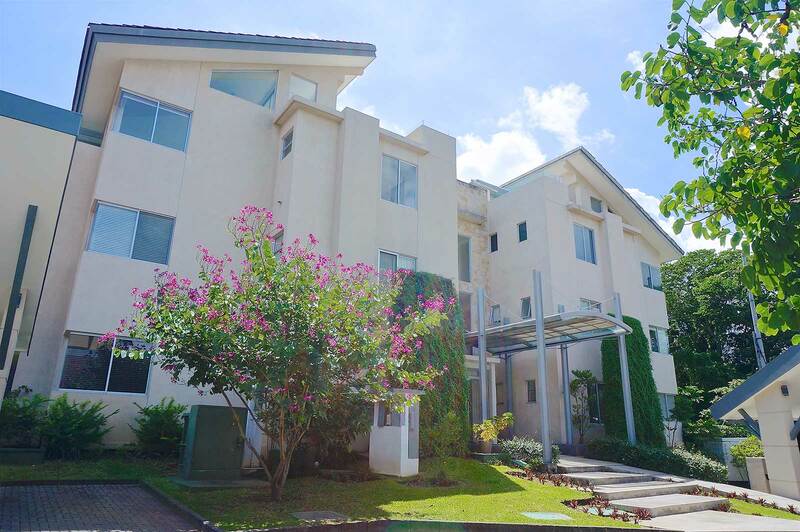 Jaco offers investors great value and there is a large range of property types to accommodate all budgets from $100,000 up. The rental market is thriving so owners who choose to rent their properties out are obtaining some of the best rental yields in the country. Because of this phenomenal growth, there is a wealth of opportunities for investors in both residential and commercial property. What is the Cost of Living in Costa Rica? Cost-of-living is a useful measurement that allows you to compare expenses between locations and over time. Expats looking to relocate in Costa Rica need to consider many factors that affect the amount of money they will spend, and it will mainly depend on the location and lifestyle they choose. The average cost of living in the Central Valley can vary between $800 – $1,200 if you are living by yourself. Depending on the area you choose you will be spending more money on your day to day basis. For example, living in Escazu, Santa Ana or Guanacaste, which are modern urbanizations with tons of foreign won’t be the same as living in Cartago, which despite being an urbanized area it’s still more rural and thus cheaper. Lifestyle will define the amount of money you spend. If you are looking for top-notch facilities, an American school for your kids with international certificates like IB, or if you are looking to spend your money on a brand new car you will certainly be spending more money no matter which location you are on. In Costa Rica, tourism is one of the main incomes, including eco-tourism. The Presidency of the Nation, the Bank of Costa Rica (BCR) and the Institute of Costa Rican Tourism (ICT) announced in November 2018 that contribution of the tourism industry corresponds to 6.3% of GDP. There are tons of areas made for tourism mainly in which the cost of living will certainly be higher. The HealthCare in Costa Rica has a government-sponsored system called La Caja, which works perfectly for Ticos and legal residents that aport a small fee depending on their income. There is also private health care, certainly more expensive than the public system, but much more accessible than in the US and some European countries. Costa Rica medical system is so good that medical tourism is part of a major movement in the country. Costa Rica is ranked high on worldwide rankings for health services in Latin America. Large supermarket chains tend to have higher prices than expected. Most Americans, Canadians, and European trying to live in a low budget rather visit the farmers market held in most towns than going to the supermarket. 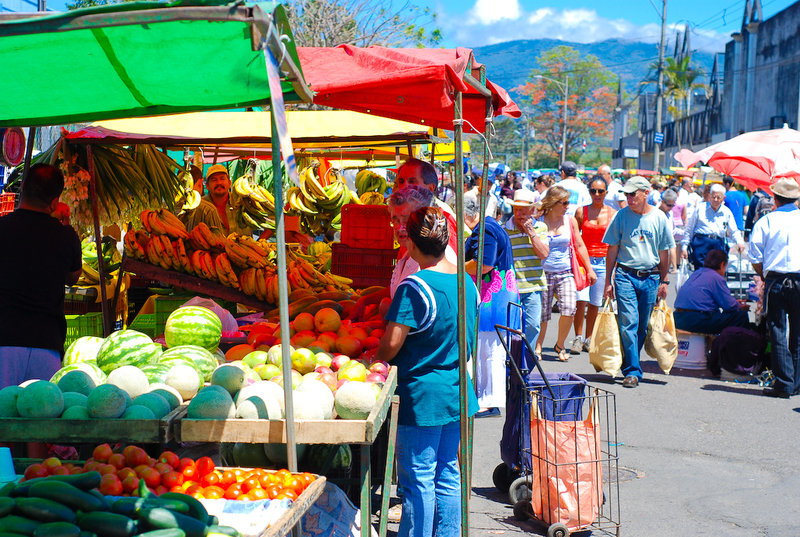 In these street markets, you will be able to find fresh fruits and vegetables to almost half the price than in a grocery store. Seeds, fresh fish, eggs, milk, artisanal cheese, and goods. Cost of renting mostly depends on your budget, a two or three bedroom apartment starts at 1000 to 3000 thousand monthly. Buying is always a safer option since you guaranteed only the payment of the utilities and those are not expensive at all. Finding the best and most affordable place to live, really depends on what you’re looking for, and if what you are looking are a good quality of life and excellent climate, Costa Rica will do for you!